Steve Stapley Car Care provides complete Model T Ford restoration from the ground up. We specialize in Antique Ford Restoration, Parts and Service. Steve Stapley has an international reputation with collectors and restorers of brass era automobiles. The Stapley's are what is known as a family of Ford Blue Bloods. It's a trait they come by honestly having either owned or repaired Model T Fords for as long as anyone cares to remember. Steve's Father Sherwin started the family auto business some 50 years ago and is still active selling vehicles from the shop behind Steve & Carol Anne's Home workshop. Steve purchased the body shop and towing aspects of the business in 1977. Restoring Model T's requires special skills, mostly determination and attention to detail, rather than a lot of fancy, modern equipment. Since 1965, the Stapley family has been restoring Tin Lizzys (originally a nickname for the Model T Ford) in Campbellford at their extensive automotive shop. 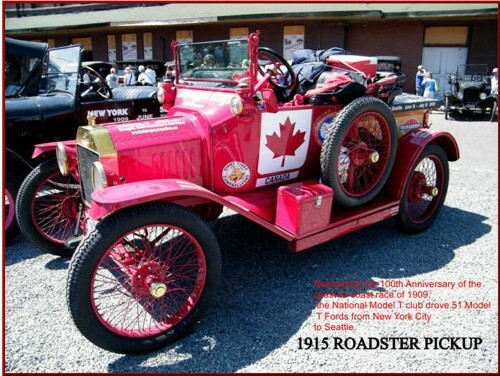 Since 1988 the Stapleys have travelled extensively throughout the United States, belonging to the Model T Ford Club International as well as the Ontario Region. Each of the older sons have built their own Model T as parts and money became available. Steve and Carol Anne were lucky enough to have a spot on the 2009 Coast to Coast Re-enactment Race New York city to Tacoma Washington. We represented Canada. There were only 55 spots. One car for each state and five spots for out of country. We drove a 1915 red pickup truck with a large maple leaf on the side specially built for the event.